Every city has its icons. 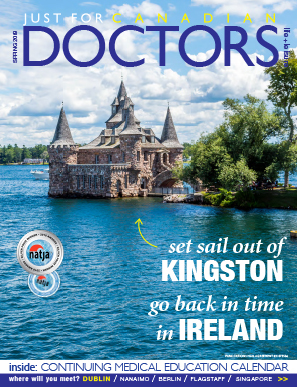 Places, people and landmarks that reveal its history and culture. The heartbeat of Buenos Aires’ porteños (“people of the port” as locals are called) thumps in its tango halls, parrillas and fútbol clubs—a trifecta of romance, indulgence and rivalry. With 48 neighbourhoods or barrios, this metropolis of three million people is alive and electrifying. But I also want to peer into its past. 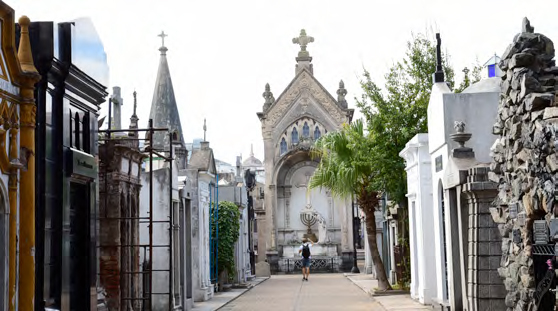 So I head to the upscale Recoleta barrio and visit the historic Cementerio de la Recoleta. This somnolent city of the dead is home to Argentina’s military heroes and politicians, including Eva “Evita” Perón. It’s surprisingly serene strolling the lanes crowded with 6,000 statues, sarcophagi and crypts. Palms offer shade from the fierce sun. Flowers find footholds in the stone. Cats play hide-and-seek under the wings of angels. The sheer scale of some of the city’s sights, however, almost overwhelm. Like the 71.5-metre Obelisco de Buenos Aires erected in 1936. I get a peek of its point on a blistering bus ride down 16-lane Avenida 9 de Julio (the widest on the planet) whose name honours Argentina’s Independence Day in 1816. 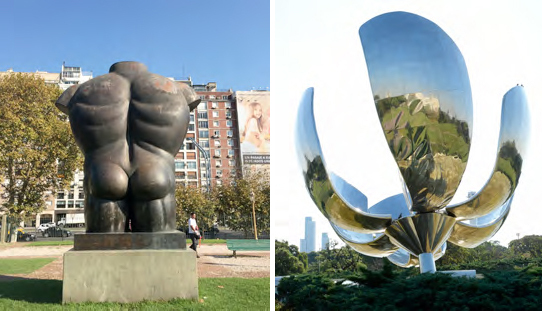 At Parque Thays I watch people smirk and smile at Fernando Botero’s Naked Male Torso, a bronze behemoth. But I’m more mesmerized by the work of Argentinian architect Eduardo Catalano in nearby Plaza de las Naciones Unidas. Floralis Genérica is a 23-metre, 18-ton aluminum and stainless-steel flower. Its six outsize petals open daily at 8am, representing “hope reborn” according to Catalano. They close at sunset like a gargantuan Venus flytrap swallowing the sky. During a graffiti tour of the working-class barrios La Boca and Barracas I see a woman’s kerchief stencilled on a wall. It’s not just a cute piece of artwork, explains Sorcha O’Higgins from Graffitimundo. 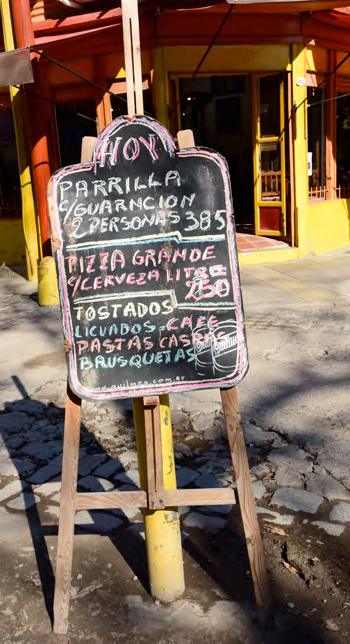 The words above it—La Boca no olvida a sus desaparecidos—pack a punch: The Boca does not forget its disappeared. 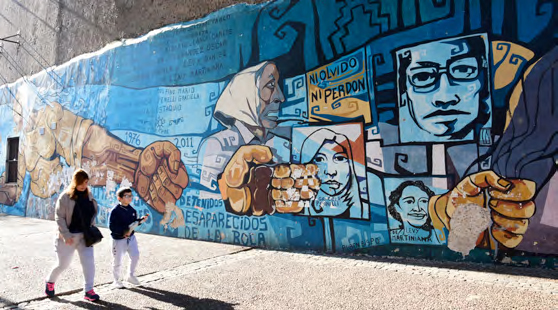 We pass a jumble of corrugated-metal buildings painted in primary colours, pausing at a mural of fists, faces, names, dates and the words Ni olvido ni perdon. Do not forget or forgive. It’s another reference to Argentina’s Dirty War. From 1976–1983 as many as 30,000 people suspected of opposing the military regime were executed or thrown off planes in “death flights” over the Rio Plata. In 1977, 14 mothers of these “disappeared,” wearing kerchiefs with their children’s names embroidered on the back, silently marched in front of the presidential palace on the Plaza de Mayo. That promise has endured. Families of the missing still march there every Thursday at 3:30pm.